The Skylark is the original designer style slide fan and light control switch from Lutron. Features an easy to use slide control that adjusts the fan speed to your desired level and rocker switch turns light on/off. Move the slider up to increase the fan speed or down to decrease the fan speed. 3 quiet fan speeds provide increased comfort. Replaces any decorator style switch and works with existing multi-gang wall plates. Coordinating Claro wall plate sold separately. Bring technology and style to your home with the Caseta Wireless In-Wall Dimmer; the dimmer that is compatible with all of today's bulb types, including dimmable CFL and LED, halogen and incandescent. The wireless dimmer gives you the ability to set the right light for any activity whether it's reading, watching TV, entertaining, or having a casual dinner. 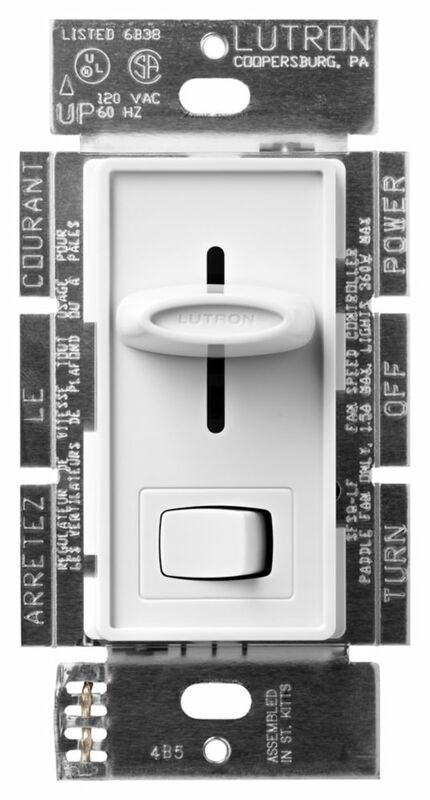 Conveniently control the dimmer with a Lutron Pico remote control, sold separately. Wallplate sold separately. Lurton's Maestro Dual Dimmer and Switch lets you control two sets of lights with the combination of elegance and technological sophistication. The dual dimmer/switch gives you the freedom to dim or brighten one set of lights to your preferred light level and turn on and off another set. The design of this dual dimmer is sleek, saves energy without sacrificing style and is the perfect replacement for stacked switches. It only works in single pole applications where lights are controlled from one switch. Coordinating Claro wall plate is included. Introducing Lutron's latest sensing technology, the Maestro Dual Technology sensor uses both passive infrared and ultrasound waves to ensure reliable sensing in small rooms. You'll never worry about accidently leaving the lights on again with the Maestro Sensing Switch because it turns the lights on when you enter the room and off after you leave. This sensor has an adjustable timeout (1, 5, 15 or 30 minutes), so you can control how long the lights stay on after you leave the room and features XCT Dual Sensing Technology (PIR and ultrasound) which detects very fine motion, such as typing at a desk or reading, ensuring lights do not turn off inadvertently. Maestro Sensors work with any bulb type, including CFLs and LEDs and will match the decor of any room in your home. Coordinating Claro wall plate and accessories sold separately. Please note Ground is required for the product to function. Skylark 1.5-Amp Singl- Pole 3-Speed Slide-to-off Fan and Light Control, White The Skylark is the original designer style slide fan and light control switch from Lutron. Features an easy to use slide control that adjusts the fan speed to your desired level and rocker switch turns light on/off. Move the slider up to increase the fan speed or down to decrease the fan speed. 3 quiet fan speeds provide increased comfort. Replaces any decorator style switch and works with existing multi-gang wall plates. Coordinating Claro wall plate sold separately.